It's one of the most wonderful times of year! Dr. Brownstone's Sweet Summer Luv Luv Festival is upon us in Winston-Salem! I attended the five days of deliciousness in 2012 and 2013 it was a week of amazing food, meeting amazing people and enjoying the creative menus of world-renowned chefs using lots of local produce, local products and local craft beers, wine and spirits. Chef Tim Grandinetti, culinary powerhouse who you may have seen on the latest episode of $20 Challenge or even on Chopped Grillmasters, holds this annual event where he invites all of his chef friends to cook, make menus together and celebrate each chef with amazing menus and fun times. Wouldn't you like to call up your friends and say, "Hey, would you like to come to my house for a week or as many days as you can, and cook all week long?" The first night of Luv Luv featured Kansas City Barbecue Society Champion, World Food Championships competitor and Food Network Grill Master Doug Keiles along with Winston-Salem Chefs: Chef Shane Moore of Foothills Brewing; Chef Mark Grohman of Meridian Restaurant, & Chef Timothy Grandinetti of Spring House Restaurant, Kitchen & Bar. The first course was presented by Doug Keiles. Before I met him, I knew I liked him. And that is all you need to know about him. But on the real: I met him in 2013 during the World Food Championships. He placed 2nd in the Bacon category and he'll be going back to Vegas in November to vie for number one. So, the food! 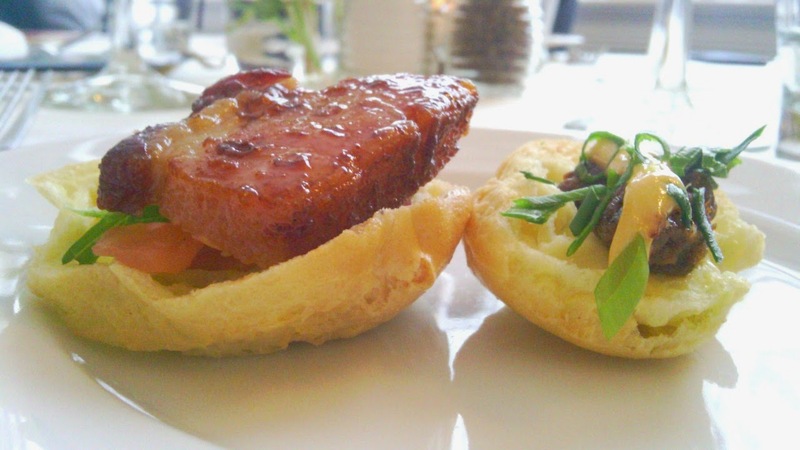 To the left: A mini BLT. The B is Doug's signiture bacon. It's rubbed with one of his signature rubs and smoked for over FIVE DAYS. FIVE. And to say that the bacon was thick cut would be an understatement. It was a half-inch thick and was amazing. The tomatoes and the lettuce and the mayo on the profiteroles distracted me from the bacon goodness, but it was delicious nevertheless. To the right: Bacon Jam with Sriracha aioli. This was my favorite part of this course. It was salty, it was a little spicy, the umami of the bacon knocked every thing else out of the park. The second course was presented by Chef Shane Moore of Foothills. 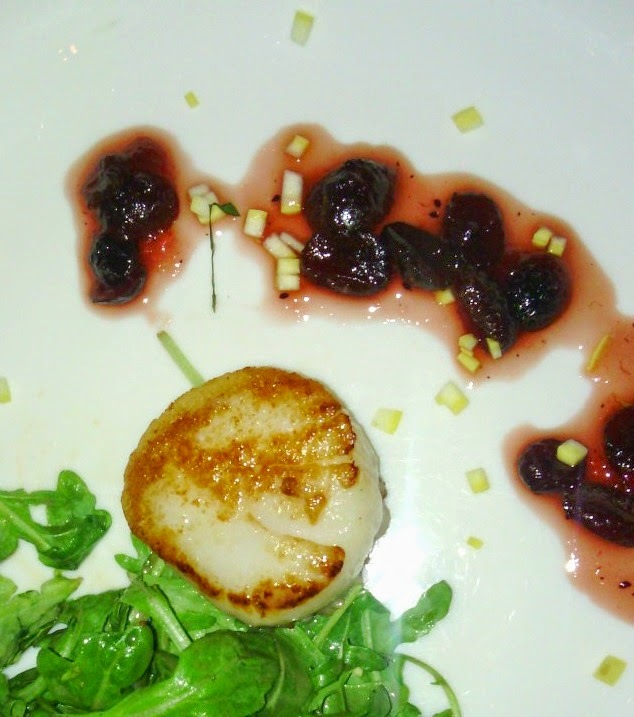 This pretty little seared scallop sat on top of an arugula salad and a corona of dried cherries was decorated with bits of raw yellow squash, for color. I have a love/hate relationship with scallops, but this one was tender and delicate in all of the right places. I could have eaten four more of these and been perfectly fine. 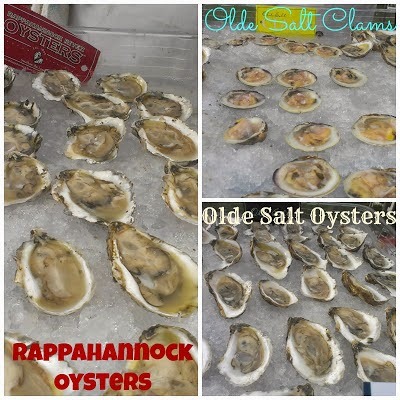 Instead, I filled up on oysters and clams from the Rappahannock Oyster Co. boys. Outside on the patio, Travis and Bernie were shucking and jiving (OKAY, I'm lying--they weren't jiving. Joking, but not jiving) and I was thrilled to see them set up when I got to the restaurant. I took this pic last year. Same clams, different day. They were back again and I couldn't resist slurping and sipping and swallowing these babies. Honestly, these are the best oysters and clams I've ever had. Do yourself a favor and have some shipped to your house. It will be a life-changing food experience for you. The next course is part of a series I like to call: Dude Food. Food for dudes who like it simple and easy and in their mouth quickly. Presented by Doug Keiles, THIS was the best piece of meat I've ever put in my mouth. I'm not even playing. The filet was perfectly cooked, to a medium rare and it was so soft, I cut it with my butter knife. I'm not even joking. 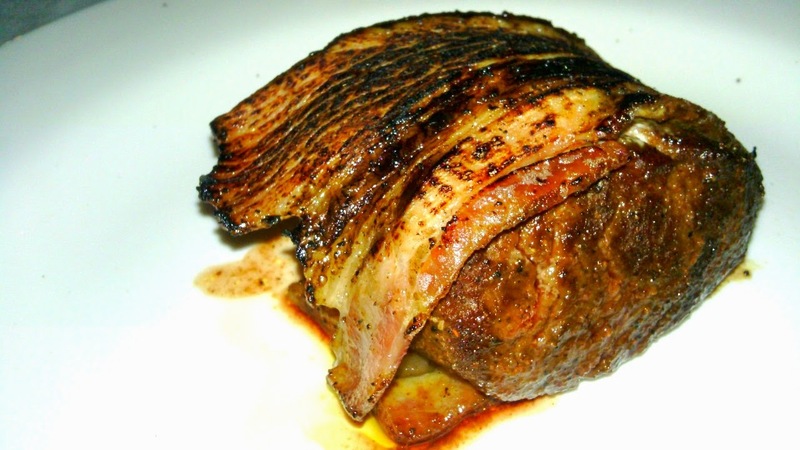 The bacon was the complete opposite of the first bacon, as it was sliced very thin and it was almost like a grosgrain ribbon, with striations of meat and fat marbling through the piece of pork. I have to admit: I got a little but misty-eyed. Underneath that ribbon of bacon was a nodule of cream cheese whipped with diced jalapenos and Doug's Hot Salt, for seasoning. If there had been an announcement that there would be no dessert, I would have been completely satisfied. Dessert was presented by Chef Tim Grandinetti and it was a simple chocolate cake with a florette of chantilly cream. 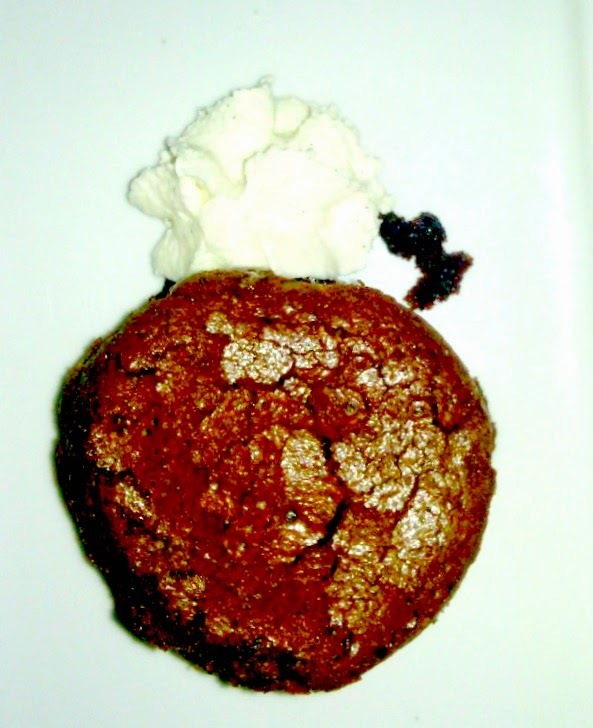 Every good chef has a go-to chocolate cake recipe in his back pocket and this was one. By the end of the night, it was dark and I tried my best to photograph the cake in all its glory, but this is as glorious as it got. All in all, the night was Sweet Summer Luv Luv Festival Lite. It had stormed earlier and the ground was damp outside, so there was no outdoor tent action going on and everyone was split into three separate dining rooms, and that broke up the momentum and the spirit of the event too. I did, however, see multiple groups of people who were once tour-goers of mine on my Taste Carolina Gourmet Food Tours. That was definitely a highlight, for me, of the night. That sounds like a meal to remember! Yum! Sounds like some amazing dishes! This looks like a night to remember with great food! Oh wow - sounds like a lot of fun and great food! Sounds like an amazing event. Very cool! Very cool event. Sounds amazing. Wow- what a super fabulous meal, Nik! I'm totally jealous! This is my kind of festival!!! Oh, this is my kind of eating! I'm so jealous - It all looks AMAZING!